At least four people were robbed within two hours during this evening’s commute across the Town Hall police district. No one is in custody. 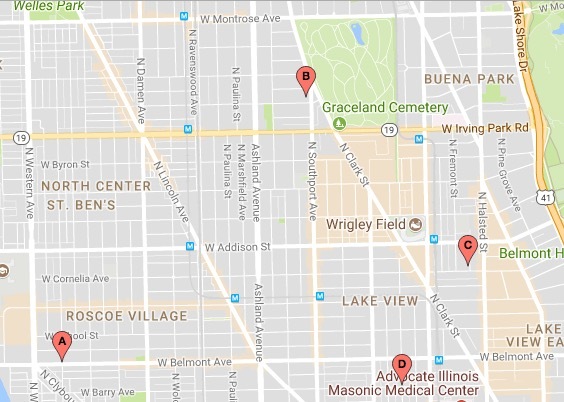 • 3200 block of North Oakley in Roscoe Village: A North Center man told police that he was walking on the street when three men approached him from behind, beat him up, and robbed him around 4:15 p.m. The offenders were three black men: one wearing a red shirt fled northbound on Oakley; one wearing a black shirt ran westbound on Belmont; the third ran in an unknown direction. All were about 5’11” tall and 16-19 years old. • 1400 block of West Belle Plaine in Graceland West: Several witnesses reported seeing two teenagers knock a woman to the ground, then try to take her purse and phone. The robbery failed, and the woman did not immediately file a police report, according to a source. The offenders were two black men 17-21 years old. One was about 6-feet tall and wore a red shirt. The other is a bit shorter and wore a white shirt. They were last seen running eastbound on Belle Plaine around 5:45 p.m.
• 3500 block of North Reta in Boystown: Two men jumped a woman and stole her phone around 6:15 p.m., police said. The offenders were two black males between 13 and 21-years-old. One was barefooted, 5’10” tall, and fled in a red Jeep that was last seen turning west on Addison near the 19th District Police station. The other offender stood about 6’2” tall and was wearing red shorts. He fled on foot in an unknown direction. • Seminary and Barry in Lakeview: A woman was robbed on the street by a man who jumped into in a black Ford Escape that was last seen northbound on Seminary around 6:30 p.m. The offender was a black man who stands about 5’9” tall.